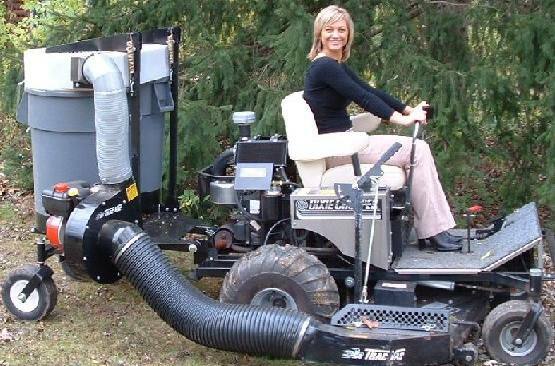 The Trac Vac Model 655 is a semi-rigid mounted vacuum designed to mount to most mid-mount zero turn riders. The tractor specific hitch allows the unit to pivot up and down without allowing for side to side movement, making the unit act like an extension of your mower frame. The 655 is fully castered with large pneumatic tires for easy handling around trees, shrubbery, driveways and other obstacles. The 655 comes standard with an 8" intake to reduce the chances of clogging, and a 6" all steel exhaust hose. All steel construction on frame provides rugged durability. The twin 44-gallon Rubbermaid® containers are easily removed for quick dumping anywhere: trash pile, pick-up truck or composter, without having to double handle the debris. Trash bags can also be easily used inside containers for the convenience of curb side pickup. The spring loaded double molded top lifts out of the way easily and has louvered top assemblies to direct air flow away from the operator. The Model 655 has a capacity of 20 cubic feet (16 bushels) to cut back frequency of dumping and down time. The perfect combination of speed and efficiency. The Model 655 comes standard with a 6.5HP Briggs and Stratton Intek I/C engine powering the air turbine for pickup efficiency of grass clippings, leaves and light litter. The engine features throttle control, stop switch, ball bearings on the P.T.O. side, electronic ignition, oil dipstick and a low tone muffler. Optional engines include the Briggs and Stratton 6.5HP Intek Pro, Kohler 6HP CS, and Honda 5.5HP engines. The engine assembly is easily removed from the vac with a single pin to make attachment and storage easier. 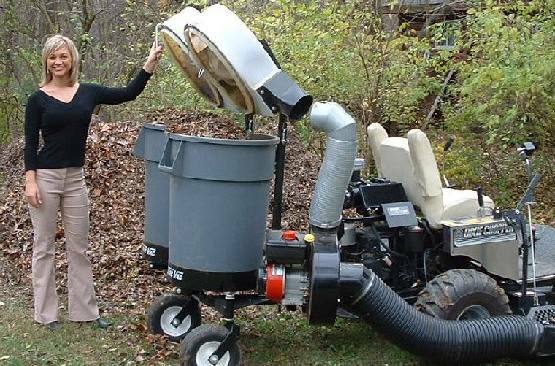 The 6HP Kohler Command CS and the 6.5HP Briggs & Stratton Intek Pro versions, the Model 655-K and 655-PRO, feature a larger air turbine assembly for greater pickup efficiency.